Yesterday the Chief Magistrate issued another — presumably the last for this year — Chief Magistrate's Direction, Number 6 of 2009. It concerns summary case conferences under s 54 of the Criminal Procedure Act 2009, due to come into force in three weeks. Direction No 6 is light on detail. Really it just repeats the information already contained in the legislation. It describes something called a Summary Case Conference Service run by Victoria Police, but doesn't go into detail about what this is or how it works. Presumably it is similar to the pilot projects already running at Heidelberg, Ballarat, Dandenong and Ringwood Magistrates' Courts, and will vary in form from one place to the next. It says that a summary case conference must occur before a matter is sent to contest mention or a request for a full brief is made, but only where a Notice to Appear has been served. According to the overview document circulated by the Steering Group a couple of weeks ago, police from different areas will start using Notices to Appear at different times through 2010. Where a Notice to Appear hasn't been served, a magistrate or registrar may still direct the parties to conference. Where an accused is unrepresented, the Magistrates' Court may direct a conference only when satisfied this is appropriate. 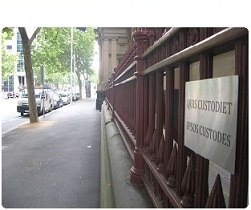 The December draft of the Magistrates’ Court Criminal Procedure Rules 2009 has also been posted on the Victorian Bar's website.